Hope your week is going well. Fabulous links at last week's party. Here are the top three most viewed by y'all. Up first with over 528 views is Fern Creek Cottage who shared a beautiful model home tour. Second with over 371 views was Ash Tree Cottage who shared her love of vintage florals from her pinterest board. Third with over 356 views is From My Front Porch to Yours. 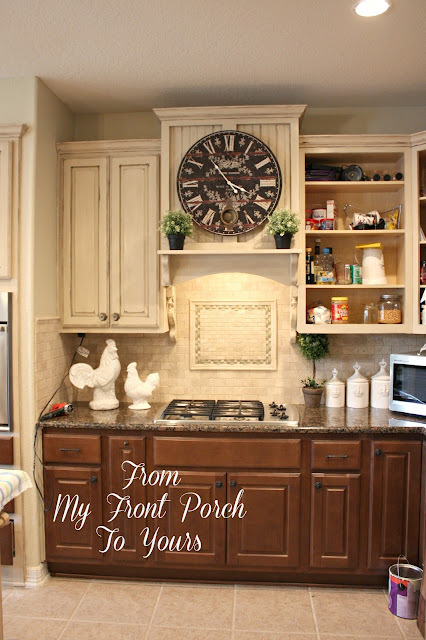 Pamela shared the progress in her kitchen reno. If you were featured and don't have a featured button just grab one from the sidebar. Can't wait for more inspiration tonight. See you there! Also my prayers go out to Boston. Great features Kim...see ya tonight! As always you feature so many wonderful ideas for all of us! Oh I am so excited!! Thanks for the feature Kim! I have a new post I just finished so I can link up to your wonderful party tonight! Fun features, Kim. There is always a wealth of beauty at your party. Thanks for giving us so much of your precious time, Kim. My prayers are in Boston too. Great top three....Pamela did a great job in her kitchen and love all those items in the cupboard! Can I enter even if my home is very very small?!?! Wonderful features, see you tonight! What a nice surprise Kim! Thanx for hosting such a great party. I had to giggle when Shirley said she likes what is in my cabinets! :) I can not wait till I get all my doors painted and back on. That was sweet of her.